It takes only one click of a button to be assaulted by conflicting and contradictory opinions from both sides of the aisle. The country we live in today is at a turning point in its history. With so many opinions vying for our attention, it provides great insight to look back at the words of a pioneer of civil disobedience for desperately needed guidance today. A prominent writer and abolitionist, Henry David Thoreau was famous for his essays on various topics in his era. One of his most profound collection of essays was “Civil Disobedience,” which postulated how much loyalty an unjust, corrupt, or in any way ineffective government deserves from the citizen who cares about the future of the country he or she lives in. Henry was thrown in jail because he refused to pay a poll tax he found unjust. In this day and age, more freedoms are allowed to people who wish to protest for the issues in which they believe. After a controversial election, many people were concerned about hot-button issues like women’s rights, science, the environment, and taxes. Following Thoreau’s model of non-violent civil disobedience, people took to the streets. On January 2, all around the world, women and their allies left their jobs, homes, and families and organized in massive marches. The Women’s March in DC drew from 470,000 to 680,000 participants, The Atlantic reported. Each participant was armed only with a sign and her voice in the true spirit of peaceful protest. 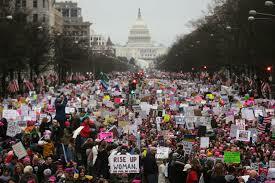 People chanted and marched down streets declaring in one unified voice, “We are Strong.” Other major cities that hosted a Women’s March were New York, Chicago, and in our back yard, Boston. In total more than 550 towns and cities registered protests and marches just in the United States. As well as us common folk, many celebrities turned out to show their support for women’s rights. Gloria Steinem was an honorary co-chair of the Washington March and Scarlett Johansson was an official speaker. Other celebrities marched with the people on the streets. Another march that took place recently was the March for Science on April 22, 2017. This march focused on our planet and the steps that need to be taken to advance science and protect the environment. After a tumultuous election, the scientific community marched to demonstrate the importance of science to citizens of the earth. Protesters gathered to encourage policymakers to make policy based on scientific evidence; provide funding for research and discourage political attacks on scientific integrity. Many scientific organizations were represented, including the American Association for the Advancement of Science, one of the biggest scientific societies in the country. One outspoken co-chair of the march included Bill Nye. The march took place across the country and the world. Major gatherings took place in Boston, San Francisco, Los Angeles, and New York. The march in Boston had 70,000 people! Not only modern times have used the idea of peacefully protesting regimes. From Gandhi to Martin Luther King Jr., some of the most ardent advocates of civil rights have used the idea of peaceful protest. Gandhi read Thoreau’s essay on “Civil Disobedience” and it inspired him to persevere in his quest for civil rights. Martin Luther King also read Thoreau’s essays, which highlighted how widespread Thoreau’s ideas became and the impact they had. Who knows, without Thoreau we might not have achieved much of the social progress we rely on today. Harriet Martin is a student at Concord-Carlisle High School and a youth blogger for The Roost.